Russia is sitting on a gas gold mine. According to OPEC figures, the country has the world’s largest natural gas reserves, with an estimated 49 trillion cubic metres in its arsenal. This equates to over 24 percent of known global sources. There’s more to be discovered, too: the United States Geological Survey estimates that Russia possesses an additional 6.7 trillion cubic metres of unearthed resources. Eastern Siberia has drawn interest from key market players for some time, as it contains a wealth of untapped oil and gas reserves. However, there are no pure-play oil fields in the region, as all contain either large volumes of associated petroleum gas dissolved in oil or free gas accumulated in the so-called ‘gas caps’. More often than not, the two types coexist. There are also entire fields of gas condensate, or natural gas. Many companies have turned away from these resources in the past, viewing the extraction of the valuable materials as too timely or inefficient cost-wise. Not the Irkutsk Oil Company (INK), though. The Russian firm has developed a unique process to extract the gas and separate it into its valuable components. This innovative approach has allowed the company to tap into vital resources, and has cemented it as a respected leader in the oil and gas sector. Almost a decade ago, INK began work on the comprehensive development of gas reserves in the Irkutsk region of Russia. The first step in the implementation of this project was the ‘gas cycling’ process – the re-injection of produced gas back into the reservoir after the recovery of gas condensate. This serves to maintain reservoir pressure and prevent the process of retrograde condensation, which can make the gas difficult to recover. In 2010, INK became the first company in Russia to successfully implement a large-scale cycling process project aimed at enhancing the recovery of heavy hydrocarbons from natural gas and from the associated petroleum gas. The project was subsequently replicated by other Russian producers of oil and gas fields in stranded gas areas where there is low or absent gas transportation infrastructure. Having maintained the extractability of the gas, the company embarked on an even more ambitious project: in order to further maximise the efficiency of hydrocarbons production and gas monetisation, it decided to implement a massive project of advanced gas processing. The project is conventionally divided into five stages and is progressing fruitfully, with the first stage already accomplished and the second underway. Within the framework of the first stage, the company has built and commissioned the natural and associated petroleum gas treatment plant with a feed capacity of 3.6 million cubic metres per day. It has also constructed a 196km-long product pipeline from its flagship Yaraktinsky field to the city of Ust-Kut, in the Irkutsk region, as well as a liquefied petroleum gas (LPG) collection and storage terminal to handle technical-grade propane-butane mix. In late 2017, gas processing at the treatment plant was launched, and in Q3 2018 the company began delivering LPG at its Ust-Kut rail terminal. The project is unique not only for Siberia, but also for the entire country. For instance, the multiphase pipeline is designed to simultaneously pump propane, butane and ethane components. On a national scale, this is a pioneering project posing substantial technical challenges, which was implemented in cooperation with leading R&D centres. Shipment of LPG will also involve the use of innovative custom-built rail tankers, specially designed for INK’s project. For the second stage, the company intends to increase the feed capacity fivefold and begin separation of commercial-grade propane and butane. 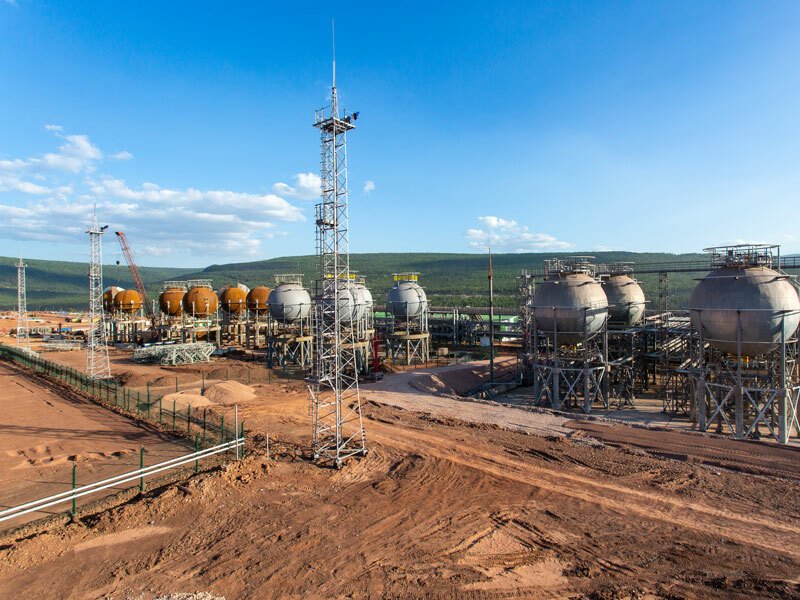 To accomplish this goal, INK intends to build three more gas treatment units at the Yaraktinsky and Markovsky fields by 2020, with a total feed capacity of 18 million cubic metres per day, as well as a gas fractionation plant in Ust-Kut. These plants are being manufactured and supplied by US firm Honeywell UOP. Annual output of finished commercial-grade product by all the company’s facilities will total 1.3 million tonnes of stable gas condensate, 555,000 tonnes of propane and 250,000 tonnes of butane. Dry gas (methane) would not be processed at this stage, and would be re-injected into the formation. Natural and associated petroleum gas produced at INK’s fields carry helium, a valuable component that is used in the aerospace, mechanical engineering, electronics and healthcare industries, as well as in MRI machines and other technologies. To allow the company to extract this precious resource, INK intends to build a helium plant at the Yaraktinsky field during the second stage of the project. In September 2018, INK signed a contract with US-based Cryo Technologies to supply helium purification and liquefaction equipment. The expected product output is 10 million litres of liquid helium per year. Commissioning of the plant is currently scheduled for the first half of 2021. In 2017, Cryo Technologies, a reputable firm specialising in the procurement of helium liquefaction equipment, was already engaged by INK to complete front-end engineering design. At the start of 2018, INK invested in the trial transportation of a helium container to assess the potential risks and bottlenecks. The container successfully travelled by truck more than 7,000km from Odolanów, Poland, to the Yaraktinsky field and then to the eastern border port of Vladivostok, Russia, where it was loaded on the ship and sailed to Japan. All in all, INK has invested an estimated $2.5bn in the first two stages of the project. All equipment required for these stages of the project has been procured and manufactured, and most of it has been delivered to INK’s production sites. based in China and Russia. Further development prospects for the gas-chemical complex in Ust-Kut are being reviewed as part of subsequent stages of the gas programme. In particular, the fourth stage involves the construction of a plant producing monoethyleneglycol (MEG) from methane. MEG is used to produce polymers, polyether fibres, electronic goods, pharmaceuticals and sanitary products. This part of the project will be implemented jointly with foreign partners through the procurement of advanced technologies and the supply of state-of-the-art equipment. As part of this stage, the company may also construct a small-scale LNG unit to provide local communities with a source of energy and help them switch from coal. As a local company, INK has a strong eco-friendly focus and implements its projects with environmental issues in mind. The cost of the fourth stage is estimated at roughly $2.1bn. The fifth stage involves even further development and implementation of other gas-chemical projects – in particular, the production of polyformaldehyde. This product is used as a replacement for metals and alloys in mechanical engineering, medicine and food processing equipment. The anticipated amount of investment required is in the range of $1.8bn. The implementation of INK’s gas project will not only revolutionise the oil and gas industry within the region, but will also contribute to an increase in processed goods produced within Russia. This increase is likely to equate to an additional annual revenue of $1.3bn from goods and products processed from the natural and associated petroleum gas when the project is fully complete. INK’s work is also helping to boost the local economy in Eastern Siberia. Since its establishment in 2000, the company has spent over $3bn in the development of the fields and licence area, construction process, and utility and transportation infrastructure. This investment has boosted regional industry and has also helped to support local businesses. Moreover, the company currently employs more than 8,000 people, many from the local area, which has helped to boost socioeconomic development in Russia’s fledgling northern territories. The modern and environmentally friendly technologies utilised by the company have also allowed production to progress in a sustainable way. It is hoped that the project will continue to bring prosperity to Eastern Siberia for many years to come.